Looking for Guaymas and San Carlos Mexico Vacation Rentals? We can help you find a home to rent that’s right for you — whether you’re staying for a long weekend or a longtime, looking for budget or deluxe, beachfront and ocean view or on a golf course. Renting a private home with more bedrooms and a kitchen may be just what you need for traveling with your family or a large group. These options are also perfect for long term stays. If you’re looking for longer-term accommodation, San Carlos and Guaymas have numerous homes available on a monthly basis. Riviera Rentals can help you find your dream San Carlos Mexico Vacation Rental. Exclusive Riviera Rentals is pleased to offer you a large selection of quality vacation rental properties located throughout Mexico’s Sea of Cortez. For your next vacation or holiday, count on us to provide the perfect vacation rental to meet your needs. First Choice Property Management is your vacation property specialist in San Carlos, Sonora, Mexico. We can help you find vacation rental homes and condos. Vacation rental homes include weekends, by the week or extended period rentals. Beautiful San Carlos Mexico is a friendly small town that is perfectly located on the Sea of Cortez. Picture yourself on a Mexico beach vacation in a San Carlos Mexico vacation rental. Enjoy soft sand beaches, a resort atmosphere, numerous activities, and a variety of restaurants. 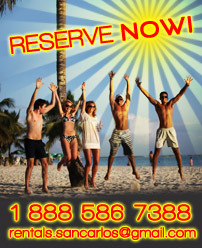 Relax in your private vacation home with space and comfort for your whole family or a large group. San Carlos, Mexico, is about a four hour drive from the US/Mexico border and five hours from Tucson. You can also fly into Guaymas or Hermosillo. General information on Guaymas and San Carlos Mexico, like weather, paying your bills, calling Mexico and sending and receiving mail. Just a plain condo near Marina Real. If you have accommodation available at a reasonable cost please let me know. Hi Alex, There are many nice condos in the Marina area of San Carlos. Please see above and contact Roberto at Seaside Reservations or Joanne at Beach Vacation San Carlos. They should be able to help you find a nice condo in San Carlos. I work with various offices and private owners with condos at Marina Real. The complex has a new pool/entertainment area that is great. There also are some apartments attached to some of the homes in that area that might be an option? I would be interested in knowing some prices please. Am on disability income so nothing expensive please and would need long term. Hi Greg, if you contact one of the vacation rental companies listed above, they’ll be happy to give you some prices. Like the villas, San Carlos condos offer more space for your money. They are typically smaller than rental homes, but may come with upgraded amenities like Jacuzzis and landscaped garden courtyards. Some condos are part of a larger complex like resorts, but they offer the perfect location within walking distance of shops, restaurants, bars, and fun.